From left, WHS Fine Arts Hall of Fame inductees Bryan Felty, Michael Underwood and Jesus “Crazy Chuy” Hernandez; emcee Margaret Felty; inductees Gary French, Deborah Tidwell and Brent Winn; and emcee Andy Reynolds. Brent Winn, class of 1972, has served as a staff member and contract professional photographer for numerous news organizations, government entities and individuals, with his work recognized by National Press Photography. Class of 1968 graduate Deborah Tidwell spent 30 years teaching in public schools, with her award-winning choirs playing Carnegie Hall. Class of 1969 graduate Gary French has worked in film, TV, stage and live studio, and currently serves as head sound engineer for the Dallas Cowboys at AT&T Stadium. Jesus “Crazy Chuy” Hernandez, class of 1970, embarked on a career in Tejano music after graduation. His career in radio extends through today, with his online presence, www.ChicanoExpress.com, streaming from Waxahachie to the world. Michael Underwood is a 1973 graduate of Waxahachie High School. He is a former member of the Tennessee Film Commission and has received major regional, national and international awards in the Addy Competitions, plus International Telly and New York Film Festival awards. The WHS Jazz Choir sang the Academy Award-winning “Shallow” during the Fine Arts Hall of Fame induction ceremony. View their cover online at www.waxahachiesun.com under the multimedia/video tab. The lifetime achievements in the fine arts by six Waxahachie High School alumni were honored Saturday evening at the Performing Arts Center, where the ceremony also showcased current students’ works as a preview to what the future holds. The event was the third annual WHS Fine Arts Hall of Fame induction ceremony, with six honorees recognized: professional photographer Brent Winn, motion picture art director Bryan Felty, choral director Deborah Tidwell, sound engineer Gary French, radio broadcaster and producer Jesus “Crazy Chuy” Hernandez and director, cinematographer and photographer Michael Underwood. All are widely recognized and many times award winners in their respective disciplines. The Fine Arts Hall of Fame is an extension of the Waxahachie Ex-Students’ Association, which honored its alumni Hall of Fame and Sports Hall of Fame inductees in the fall. 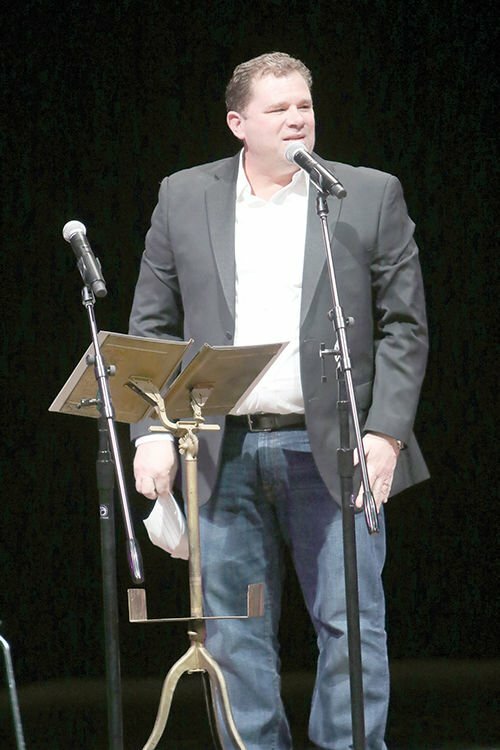 Felty emceed the evening with WHS drama department head director Andy Reynolds, who extended the committee’s appreciation to the event’s sponsors and silent auction donors. A short video was screened for each of the honorees, with each depicting key moments from his or her life, from childhood to career highlights. Each then took the stage to share a few words. In his remarks, Winn expressed his appreciation to Waxahachie High School and his family. He also extended his thanks to Stephen and Rebecca (Bigham) Wright, who have funded an annual $1,000 scholarship in his name. “Thank you very much,” Winn said in accepting the honor. Quoting Academy Award-winning director and WHS graduate, Robert Benton, who made several of his films in Waxahachie, Felty said, “Waxahachie is where a lot of what I am got figured out.” He expressed his hope that future graduates would all follow their dreams, as well. Class of 1968 graduate Deborah Tidwell spent 30 years teaching in public schools, with her award-winning choirs playing Carnegie Hall, among other honors. In introducing her, Reynolds noted how her work has touched “thousands of lives” over time. A Who’s Who Among America’s Teachers and Teacher of the Month recipient, Tidwell remains active in music, serving as a church musician and founding board member of Waxahachie’s Old-Fashioned Singing Project, which is in its sixth season. Class of 1969 graduate Gary French has worked in film, TV, stage and live studio, and currently serves as head sound engineer for the Dallas Cowboys at AT&T Stadium. His body of work includes working on the TV series “Wishbone,” “Jimmy Neutron, Boy Genius” and “Barney,” while picking up an Emmy and numerous other awards at national and international film and video festivals along the way. Jesus “Crazy Chuy” Hernandez, class of 1970, embarked on a career in Tejano music after graduation. His career in radio extends through today, with his online presence, www.ChicanoExpress.com, streaming from Waxahachie to the world. He’s been named a “Living Legend” and is also an inductee in the Tejano R.O.O.T.S. Hall of Fame. “For 48 years, you’ve been the love of my life,” he said. In his video, Underwood had shared those teachers who had impacted his life as a WHS student, including Lucille Smith, Wanda Cain, Kathy Howard, James McNeil and Pat Sawyer. In offering his encouragement to the young people on hand, Underwood said, “Don’t let the good interfere with the great” while also passing along wisdom he’d received from his mother, celebrating her 90th birthday and on hand for his induction into the hall of fame. Interspersed with the recipient presentations were performances by the WHS Jazz Band under the direction of Rich Armstrong, the WHS Jazz Choir under the direction of Jeremiah Ieppert and the Cherokee Charmer Officers under the direction of Erica Wilcox. In the foyer were exhibits of current students’ art, with fine arts teacher Sean Cagle on hand, along with culinary arts chef Joel Skipper and his students, who prepared and served a dessert buffet for guests. Information about the Waxahachie Ex-Students Association is available online at https://waxahachieexstudents.org/.